Mystic Korea: Gangnam Oppa aka Gangnam Style : Psy ajassi is getting appalause ! Gangnam Oppa aka Gangnam Style : Psy ajassi is getting appalause ! If you thought the Oscars were too boring, try watching the Korean award ceremonies at the end of the year. Tied down by decorum, everybody forces themselves to stay serious and modest; actresses with plunging necklines remain buttoned up in demeanor. The same could be said about K-pop. The industry has so strenuously but unsuccessfully tried to break into the United States, the world’s largest record market, with its mix of faultlessly produced electro-pop, complex choreography and toned thighs because it lacks humor. So seeing someone as funny as Psy achieve fame in America should not come as a surprise, although many pundits here and abroad seem to be scrambling for an overly complex — serious — answer. The 34-year-old rapper’s music video for “Gangnam Style,” his latest single, became an Internet sensation with 65 million views on YouTube and countless parodies worldwide simply because it is a highly amusing video with catchy music and dance moves. It is light entertainment, not a political message, mostly. Psy, whose real name is Park Jae-sang, is a specialist in this breed of Korean pop music; his previous records were all hits in the country and several of them chart-toppers. The video’s exceptional international recognition is heavily due to social media. As the New York Times wrote on Aug. 21 about the phenomenal success of Carly Rae Jepsen’s No. 1 hit “Call Me Maybe,” YouTube is fast replacing radio and MTV as the go-to channel for new music discoveries. Without any national market barriers for distribution (albeit for free), it also kickstarted K-pop’s popularity in unlikely places such as South America and Europe before anyone knew there was any market potential. 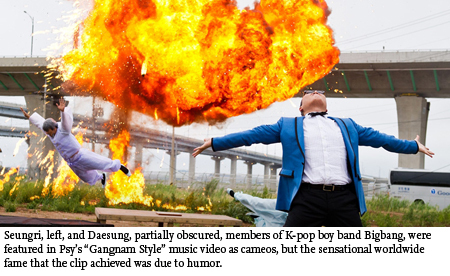 Psy’s case is no exception. Then, the likes of Robbie Williams and T-Pain shared the “Gangnam Style” video on Twitter, and thousands of retweets followed. There was no stopping the clip’s viral spread ever since. Much ink has unnecessarily been spilled over the song’s alleged social commentary on Gangnam’s materialism, suggested by a U.S.-based Korean blogger named Jea Kim and propagated by Max Fisher at the Atlantic and even Andrew Sullivan quoting it on the Daily Beast. Putting so much weight on the argument is misguided, however, when looked at from a larger perspective. It is anyone’s guess how far and how long this international stardom will last, with one incredibly catchy song alone — it is now climbing the iTunes singles chart, placed at No. 44 as this article goes to print — but one thing to avoid is reading too much into it. Just enjoy the infectious beat and do your best rodeo dance this weekend.